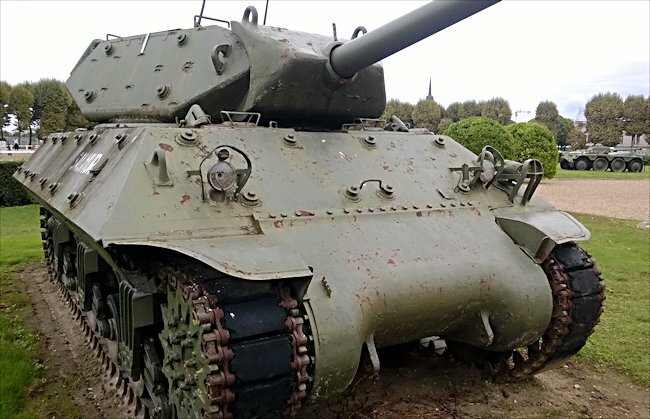 These M10 Wolverine Tank Destroyers can be found in Saumur. 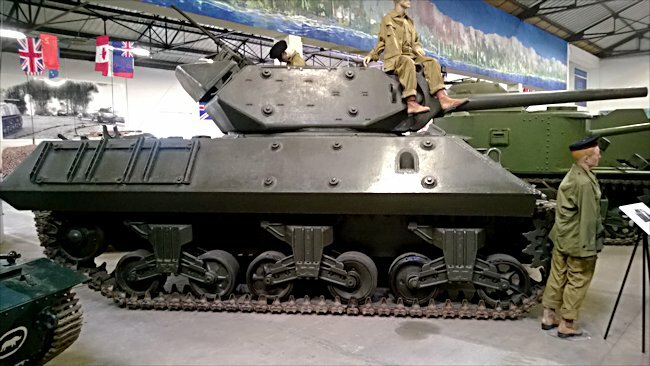 One is in the French Tank Museum in Saumur in the Loire Valley. The Museum is called Musée des Blindés ou Association des Amis du Musée des Blindés, 1043, route de Fontevraud, 49400 Saumur, France www.museedesblindes.fr . The word Blindés means armoured. 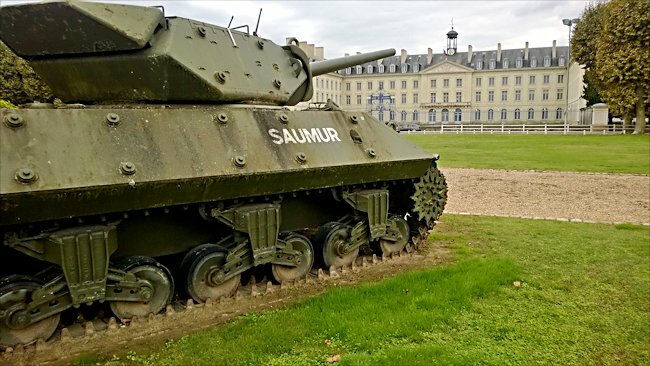 The other is in the parade ground opposite the French Army Calverly School, École de Cavalerie, Avenue du Maréchal Foch, Saumur. M10 Wolverine Tank Destroyer crews had to Shoot and Scoot! 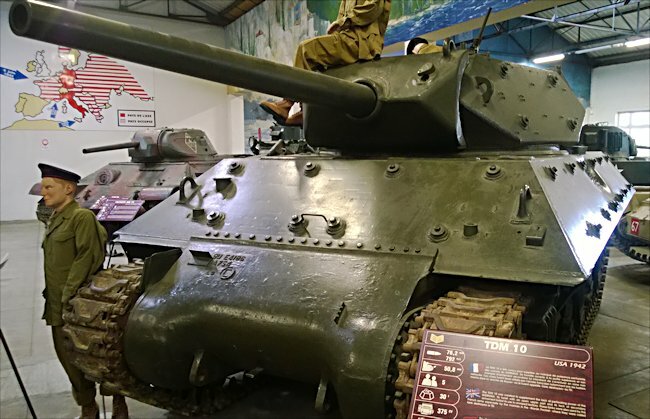 The US Army designation always starts with the weapon so the correct name for the M10 Wolverine Tank Destroyer is 3 inch Gun Motor Carriage M10. 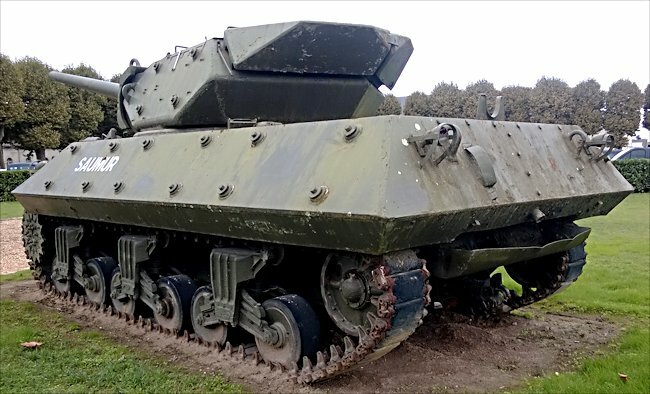 Although the M10 Wolverine Tank Destroyer looks like a tank, it is not a tank. It cannot fight like a tank because it has very thin armour. When it first arrived on the battlefield in Tunisia in 1943. Its 3 inch 76.2 mm M7 gun was better than any cannon currently installed in American tanks. It had better armour penetration and a longer range. During the Allied invasion of Sicily, Italy and later on Northwest Europe after D-Day the M10 Wolverine Tank Destroyer crews had to use different tactics. Their light armour gave them speed. They had to deploy 'shoot and scoot' tactics. This meant that they would rush to the scene of a break through, hide, shoot at advancing enemy tanks and quickly drive off to find a new ambush location. The American tank designers wanted a way to put a bigger gun into the tank. They had learnt from the problems the British and French had experience in the battle of France in 1940 and the early North African campaigns, where they had found the penetrating power of the tank shells ineffective. When the Americans landed in North Africa there Sherman tanks only had a short barrelled 75 mm gun. The engineers had not worked out how to upgrade the gun at that stage. The M10 Wolverine Tank Destroyer gave the American army commanders much-needed extra punch. The turret was open to the elements for a couple reasons, the main being weight reduction. The survival of this tank destroyer relied on its mobility so that he could get out of trouble fast. It enabled the tank commander to look for long-range enemy targets more easily. Many of the crews had tarpaulins they could use to keep the rain off. This vehicle was not designed to support the infantry during the advance by going with them as a mobile machine gun nest. 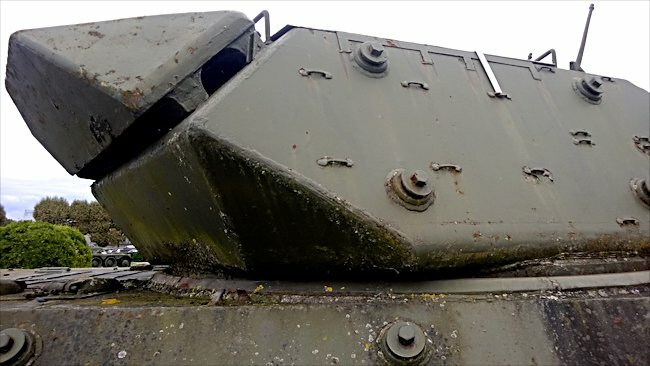 If you look at the front of the hull, you will notice there is no machine gun. There is also no coaxial machine gun by the 76.2 mm main gun. The commander did have access to .50 inch Browning M2HB machine gun from the top of the turret for self-defence. Again the main reason for these machine guns not be fitted to the vehicle was to keep the weight down. On Christmas day, 1944, during the Battle of the Bulge, American troops on the outskirts of the town of Bastogne in the Belgium Ardennes were under attack by German Panzergrenaders and tanks. A message came through over the radio that there were seven enemy tanks and lots of infantry coming over the hill. The American 502nd headquarters were in Rolle chateaux was in the firing line and was evacuated immediately but cooks, clerks and radio operators were rushed West to meet the threat. Colonel Chappuis with only one officer the radio operator now manned the command post. The longer 76.2mm gun fitted to the M10 TD required a heavy counterweight placed to the back of the turret. He could see the oncoming panzers in the dim light only a half a kilometre away. Two M10 Wolverine tank destroyers from the 705th Tank Destroyer Battalion engage them from conceal positions behind a haystack. As they withdrew to change positions, they were both instantly knocked out. The German battle group then encountered the men of American B and C Companies of the 502nd as they came rushing to help deal with the enemy following the Colonel's request for reinforcements. From the shelter of the woods by the road, they opened up with machine guns, rifles and bazookas. This attack killed most of the Panzer Grenadier's clinging to the sides of the tanks. Two more M10 tank destroyers arrived. They were able to fire at the sides of the advancing German tanks. They managed to knock out three tanks. Handheld anti-tank bazookas knocked out three more German tanks. A badly damaged M-10 tank destroyer had come to a halt by the side of the road from Saint-Denis to Lengronne. The crew inside played possum as the German column passed, then, as soon as the last half-track had gone by, they brought their three-inch gun to bear and began knocking them out, one by one, firing twenty-eight rounds altogether. 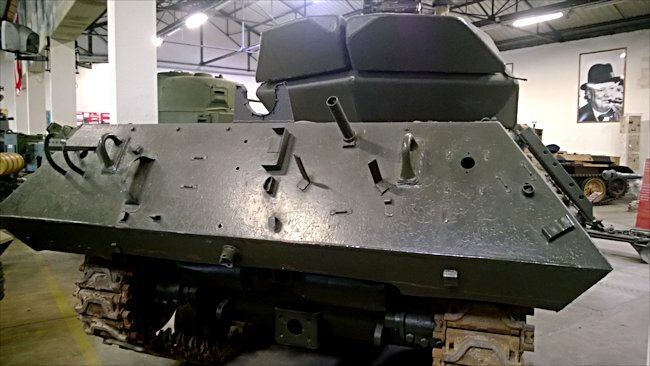 Where can I see more M10 Wolverine Tank Destoyers?